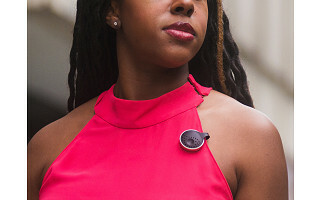 This personal alarm for women—or anyone who wants some extra piece of mind—can alert friends and loved ones of your location. 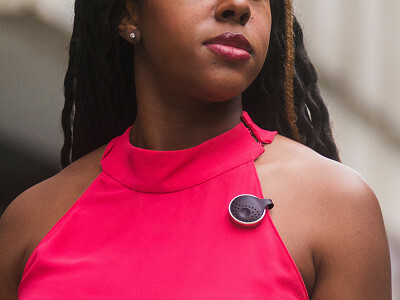 Athena is a discreet wearable that sends GPS notifications to emergency contacts via Bluetooth. Attach it to your clothes, bag, or backpack. Or even wear it as a pendant. There are two modes. One sounds an obvious, high-frequency alarm to frighten attackers as it simultaneously send a distress message, with your location, to your chosen contacts. The other mode, called SilentROAR, alerts your contacts in a silent, discreet way. Co-founder Yasmine Mustafa was moved to start Athena after solo-trek through South America where she met locals and travelers who had been victims of assault. ROAR for Good is a certified B-Corp that, besides inventing a device, is helping change the environment that makes women unsafe. They run educational programs to teach youth about healthy, respectful relationships and treatment of others. Hi all! I’m Emily Pfister, Communications Manager of ROAR for Good. 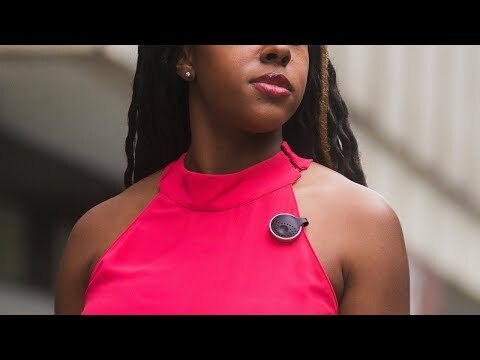 I’m excited to launch Athena—our wearable safety device—on The Grommet today. As a socially minded company, Athena is part of our mission to help make the world a safer place, one where anyone can live their life boldly. I’m more than happy to answer any questions you may have! DO YOU HAVE AN OPTION FOR SECURING IT FOR RUNNERS? @Tonya Hey Tonya! We've made every effort to make Athena as affordable as possible while staying true to our mission to reduce assaults and empower women. This is why for each device sold, we take a substantial portion of the proceeds and donate them to programs dedicated to teaching empathy, respect, and healthy relationships to youth. Hope this information helps! I love this for my daughter and niece who are away at college. How long does the battery last on a single charge? @Jean Hi Jean! The battery typically lasts around 2 weeks, but can be more or less depending on how often Athena is activated. When I notice my battery is getting low, I usually charge mine overnight or while I'm hanging around the house since it only takes a few hours to charge. @Emily Thanks for the details! @Jean No problem! Have a great day! Do you also need to be carrying a phone for this to work? @Linda Hi Linda! Yes - in order for Athena to work, the device will need to be connected to your phone :) hope this information helps! Is it possible to sound alarm only without sending message to personal contact person? Is there a monthly fee for this? @Karla Hi Karla! Nope - there is no monthly fee to use Athena and the app is free to download! How does this send text messages? Does it connect to your cell phone via bluetooth, or would we have to purchase a data plan from our cell providers? What do the texts to friends and family say? @Belinda Hi Belinda! You can customize your status to say what you'd like. In case of emergency, your contacts will get an SMS message with a link to your location stating that you activated an alarm and need immediate help. Hope this answers your question! Are there plans for the device to be enabled to contact 911. I am not sure there is peace of mind knowing your friends and family will be contacted if you are being attacked. I would purchase this product for my wife and daughter's if I knew law enforcement was notified. @Tim Hi Tim! We are in the process of rolling out a feature that will contact 911 directly. We plan to have this out by the end of the year. It will not require a new device purchase, and will instead be activated via an app update. @Emily @Tim you can also contact your local police/fire dispatch center to see if they have 911 via text. Some communications centers are offering this as an alternative to calling in emergencies. Hey @Nancy! Yup - Athena works worldwide as long as you have a smartphone and cell service. Additionally, the device will work if your smartphone is connected to wifi. Hope this information helps! I see that the battery lasts approximately two weeks between charging but am wondering if there is an on/off on the device to power down and save battery when not in use. Also in what format is the location sent via text-- a map, a GPS coordinate, or...? Hi @Sandra! That's a great question - when Athena is not activately in use the device automatically goes into power saving mode so the battery won't drain quickly. I've personally gone over a month without needed a charge simply because I wasn't activating the alarm. In regards to the format - your emergency contacts will get an SMS message with a link to your GPS location on a map. Great idea but the cost is extremely prohibitive. Only a small percentage of people can afford this at the price point so while your mission is admirable you cannot educate many if they are not selling. When I clicked on the link and saw the cost I choked on my coffee. Hi @Kayla! Thank you for the feedback - I wrote this in another comment, but I also wanted to let you know here that as we grow we are always looking for way to reduce costs and expand upon our social mission. Please feel free to let me know if you have any questions or additional comments. Have a great day! Lastly - I wanted to let you know that our ROAR Personal Safety app is available for download at no charge, and you can utilize some great features including sharing your status while you're out so your friends can watch over you, and Stories for Good, a collection of articles and resources dedicated to women's empowerment and other relevant information. Upon activation will the device continue to be tracked if on the move or will it only give the original location? There are two modes. One sounds an obvious, high-frequency alarm to frighten attackers as it simultaneously send a distress message, with your location, to your chosen contacts. The other mode, called SilentROAR, alerts your contacts in a silent, discreet way.